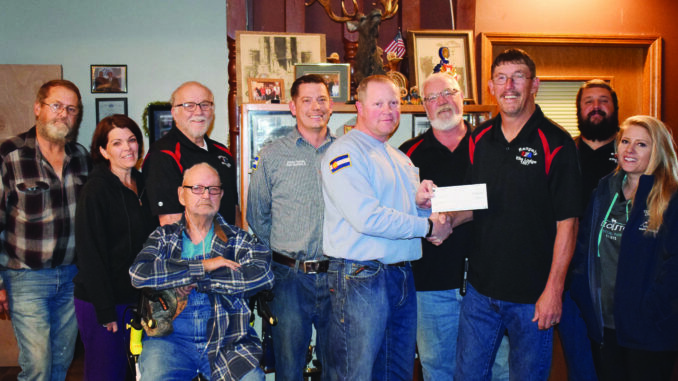 Chevron representatives James A. Francis and Michael Gillard presented Rangely Elks Lodge #1907 and its Exalted Ruler Jeff LeBleu with a donation for an undisclosed sum. Also present for the presentation were the following members Norm Hall, Gretchen Connor, Mike Miller, Larry Yardly, Don Reed, Chris Hall and Jillien Wade. This generous donation will aid the Elks annual help for needy families program and the children’s Christmas party this holiday season.